Today was kind of quiet. Mom and I did a few little things around here to start the day. There was one run to town followed by recording time. Ending my Day was roping but that is pretty normal this time of year. 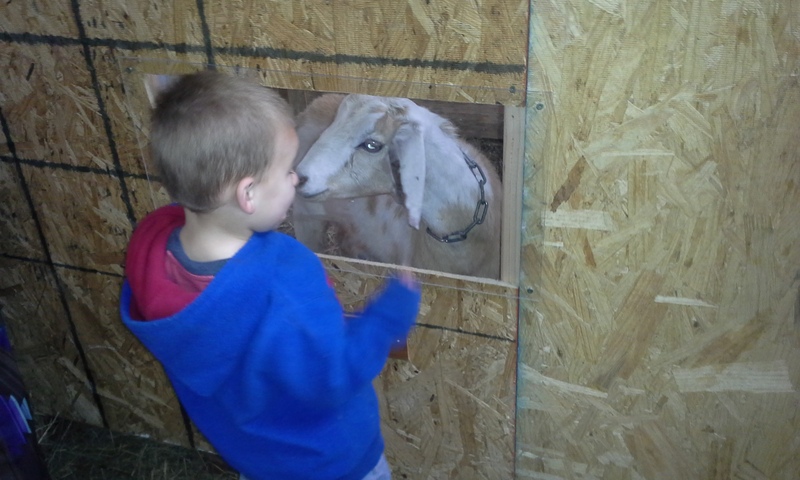 Mom and I took time today to fix the “people gate” to the Goat pen. You see Curly and the Billy can both jump it. They have several times so Mom and I raised it up a bit so that they have to stay put in their pen. We also took the time to fix the brace that goes across it but Mom says she is going to work on remaking that gate. It was her first gate and she isn’t happy with the way it turned out. After that we ran to town to pick up some Dog food and some People food. You see here on the farm as things warm up No one in the house seems to want to eat. Seems like the hotter it gets the more we don’t want to eat anything but sandwiches and salads. Okay, Mom eats the salads but I eat the sandwiches. Anyway, Mom needed to pick up stuff for sandwiches. She also made sure to pick up some chips and cottage cheese and apple sauce to go with those sandwiches as you know you can’t eat a sandwich alone. To get the full affect make sure you check out the lesson plan that goes with it. You can find it HERE. 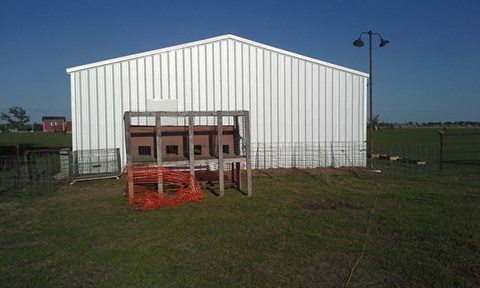 So as most of you know, Since we got the new barn up we have been working on little things to make the place better. Today some of those little things got done. With one kind of not so good thing happening. 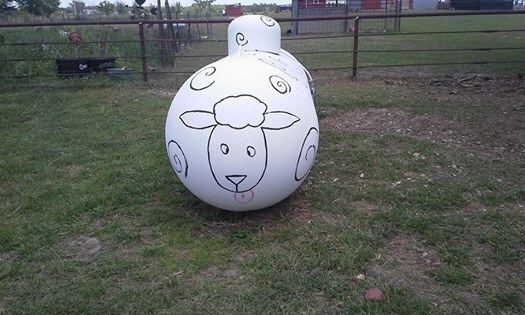 First, Mom painted our propane tank to look like a sheep. 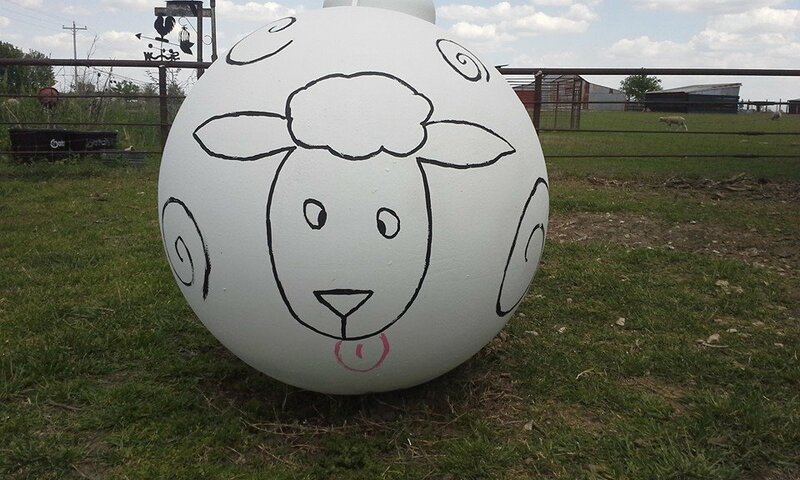 Okay, a cartoon sheep but a sheep none the less. I made her add the tongue! After that I went to work with the horses. Storm had issues today which isn’t a good thing. First, I couldn’t catch her. So I worked her down to see if that would allow me to get her haltered. Well, It might have if Mom’s buddy hadn’t spooked her with a perfectly timed Scream from the pasture. Storm ran head on into the fence! She is okay, but she now has three small cuts on two of her legs and a small scrape on her nose and at the time a bloody nose. I ended up catching her by roping her and got her calmed down, cleaned up and hosed off. By the end of the day she was fine. I did juggle the pens a bit tonight and I am hoping that will end that issue in the future. 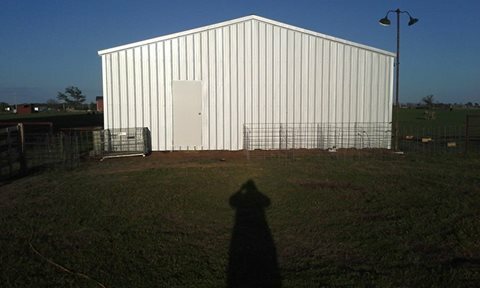 The last thing that happened is that the Duck runs were sold to someone and moved to their home and are now not blocking the door to the new barn. Today I learned two things. First, I learned that even something as simple as a flat tire can go so horribly wrong if not handled right. You see on the way to help a friend break in a new set of calves, this truck took up more then his share of the road and that made Mom take the trailer off the edge of the road we were traveling on. The sidewall of the tire was shredded with the edge of the black top giving us a blowout on our trailer. A couple of people drove by us as we got the jack and spare tire out. Some even rolled down their windows and asked if we were all right. We told them that we were fine and they drove off. I figured I had it all under control. After all it was just a blow out. I have changed plenty of tires. Well, with over 2000 lbs of horse (we were in the two horse trailer and had Ice and Coop with us) and the weight of the trailer and uneven ground my first attempt at changing the tire went wrong. The only injury was I cut my finger up a bit when the jack fell. You see the way I did the trailer, that resulted in the fall, was the way I had seen Dad do it 100 times. I was stunned. I told him I just needed two more hands, One to crank the jack and one to balance the trailer. His only words were “Well, you got ‘um”. We finished the task at hand without another word. Then, after I lowered the jack and got the horse back in the trailer I shook his hand and thanked the man. With that he nodded his head, got in his truck and drove away. I put the jack and the blown tire in the bed of the truck and Mom and I got on the road once more headed to the arena. That is when I learned lesson #2. As Mom drove she made one statement … “Thank you God for sending that Christian to us.” “Christian?” How would Mom know if he was a christian or not? Well, when I asked I found out. Mom said that God had answered our prayers there on the side of the road. Okay, I get that, I did say that only the hand of God could get that done and okay, he did it in the form of a man. I get that too. However, where did the Christian thing come from. Mom said it was the way he helped. First, he didn’t ask if we needed help he just asked how he could help. Second, he didn’t do it from the window of his moving truck. He stopped with the intention of helping. Third, he put his own personal truck in the line of fire for a horse he didn’t even know or own. And last, he didn’t do it for thanks as I barely got it in before he got in his truck and left. Mom saids that being a christian isn’t about saying or asking anything. It is about taking action and this guy did just that. He didn’t think of the cost or what could happen if something went wrong. He just took action to help us and to help keep the horse safe. He was unselfish and that is what Mom says makes a Christian. She then told me that I should remember that and always take action, not debate what needs to be done or how to get it done. You know something … I think Mom is right. Being Christian is being called to action. Acts of love and kindness is what it is all about. The good thing is that we know who this man is and yes we posted a thank you to our Facebook page to him. It is the least that we could do. After all he did teach me what makes a good Christian Man and that is what I strive to be every day of my life. Today was cold and windy with a touch of overcast clouds … A stay indoors kind of day. Mom had her buddy but it was one of those days when they found things to do inside. As for me I made it to the roping pen but I cut is short because of the weather. This after Noon my Buddy came by to work his lamb. 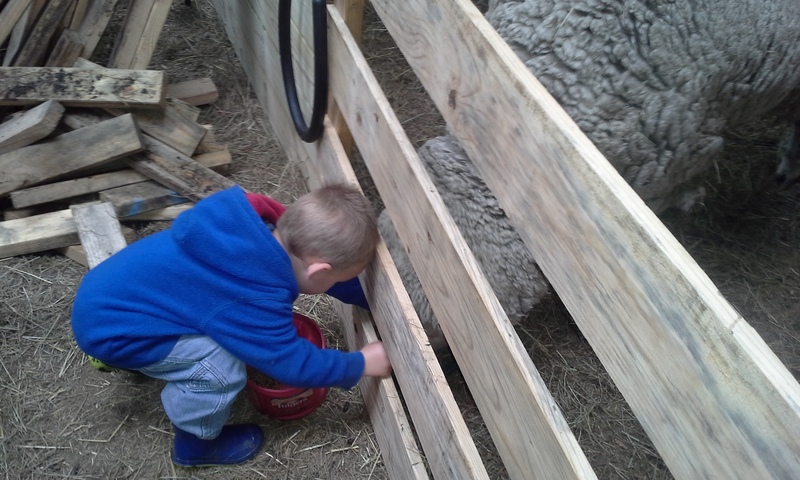 I don’t know If I have said anything about our young man that is going to show a lamb at the fair. Well, He really doesn’t have a place to keep one or the know how to show one. 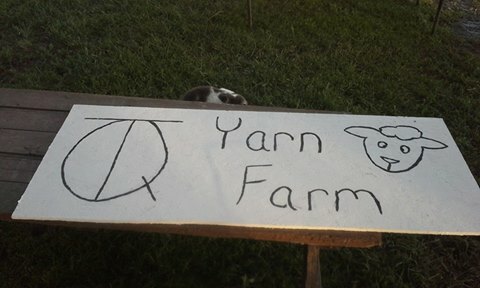 So he is borrowing our lamb, Patches, and our house. He has come to the house after school several times and has bee working to halter break Patches. The last time he was here he learned that putting her in a pen just isn’t enough. He learned you have to put a halter on her and tie her in. Anyway, he is coming to the house regularly to work with her. He is doing good but it will get even better once she is weaned. Other then that there isn’t much going on around here. We are waiting on Sweetie though. It looks as though we will have at least one Goat be a Momma this year. We are praying for more but Sweetie is bagging up so I guess I will admit that she has to be preggo this time. So yesterday changed in a flash. You see, Yesterday was Mom and Dad’s 23rd Wedding anniversary. I was headed to a roping with Dad while Mom went to a bazzard called Spring Fling. Then we were suppose to get together for a nice pulled pork Dinner. Well, to start with Dad forgot his own anniversary. So I went to my Roping as planned and there it was great. I did my personal best with a time of 8.9 Seconds. I won a round and the average. I was super stoked and overly excited. With my roping going so well, Dad suggested that he take me to an open rodoe. Mom forbid me to tell him that it was their anniversary so I have no reason to say no. Anyway, I didn’t get home until after 3AM. And I just got up very late because of it. I have about 2 hours before I head up to my Uncle’s house to help him work Cattle. Have you ever had one of those days where you were busy all day long but yet nothing got done? Well, there were four of us at the farm today and yet nothing really got done. Me and my helper started our work day working on the feeders. I made several feeders but today we put the “feet” on them. That way if they start to rot it will just be the feet and we can replace them easy. We spent quite a bit of time putting the feet on the first three as my Helper had to learn to us the drill. 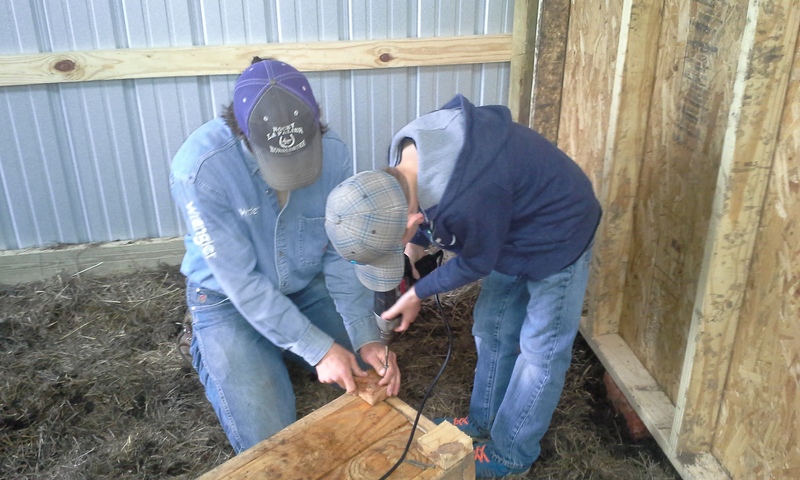 Then we started working on the fourth feeder and he had to learn to use the saw too. The short of it … We spent more time teaching then we did actually working. However, we did get the feet on but we didn’t get the other feeder made. It is about half done. After lunch it was more of the same with the exception of working the lambs for show. We ended our day with dinner and a dessert of ice cream from Sonic! So today Mom and I spent most of the day doing the running. 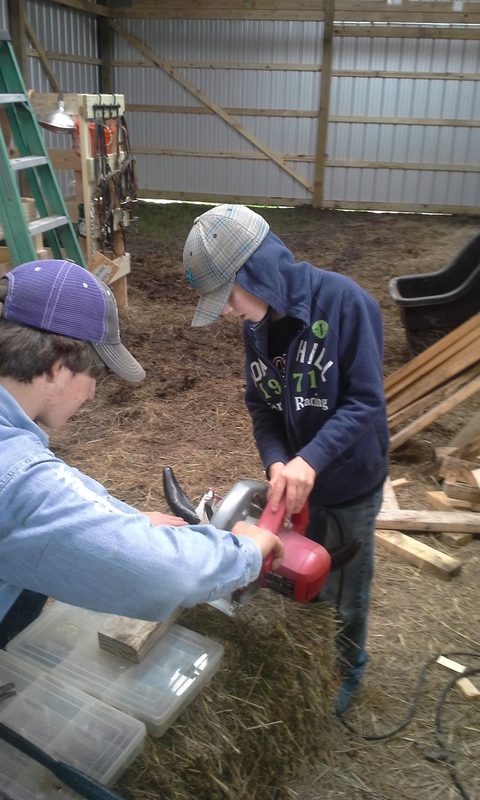 We had to take care of some stuff with the cattle note, Stop by the extension office for 4-H and go get feed. However, none of that required that we get up this morning early. To bad Mom said we were getting back on track. She had me up before the dawn. We got some things done around the house before running the errands. We are still working on our inspection check list. The truth is that we are going to pass with no issues. Mom on the other hand wants everything perfect. Through the year the fiber room gets a bit cluttered. Mom always wants it cleaned up before the inspection even though it isn’t part of the farm they inspect. Anyway, We sent the rest of the day going through things and sorting what will go in the shop and what will stay in Mom’s “work space” I will say the work space looks better and Mom says she is going to start going through totes one at a time and get rid of things she doesn’t use anymore. I hope that she does … We have a lot of things we used to use but now have different things that do the same job. For example Mom has two swifts and a yarn skeiner. We no longer use the extra swift so it is going into the shop and Mom says if it gets no use there it will be gotten rid of. Anyway, I am kind of tired since I was up early today and Mom says we are going to do it again tomorrow and get back in the habit so I am going to head to Bed!